Much like a wedding, this card has a little something old with something new (and something blue!). Today we celebrated my cousin's son who took his first Catholic Communion. This cool kid made a stand today in his faith and it was a party for us family. 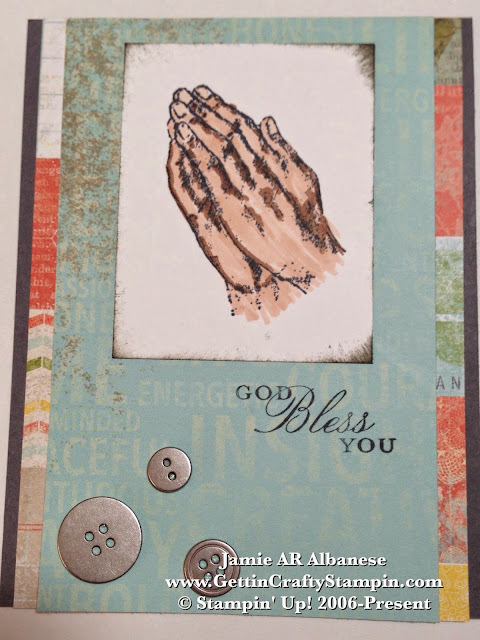 So using this cool Retired 'Praying Hands' solo stamp, the soon to retire Epic Day This and That Designer Series Paper and the new Skin Tone Blendabilites for a card that celebrates this momentous event in his life. Retired doesn't mean tired! Our stamps are timeless, classic and beautiful! I love this solo stamp that came out years ago - and hoard it (I've had large cash offers for it - but can't imagine not having it in my collection!!). See our soon-to-retire collection of stamps, papers, inks, accessories and more. They are a great way to stock up on exclusive, no longer available to order stamps and supplies that will make your projects shine! In order to use the new Blendabilites markers you need to use the new Memento ink pad. 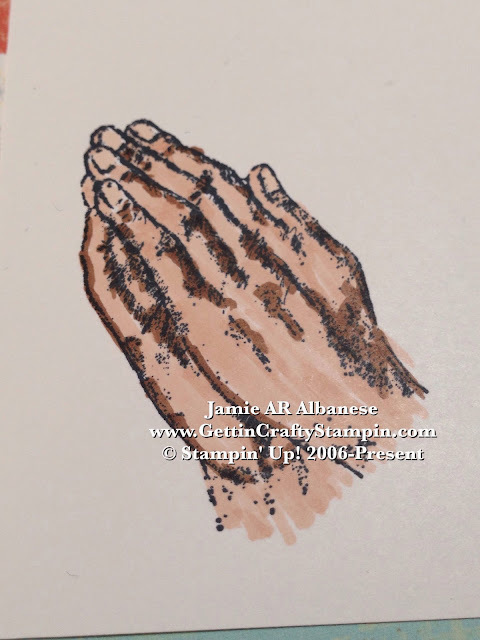 Stamp this Praying Hands stamp on Whisper White card stock. Using the Skin Tone to color in the hands. A lighter for the nails. Adding the darker for shadow. This collection of makers allows for shadow and depth while looking good!! Layered over the Epic Day This and That Designer Series Paper these Praying Hands look so good. Adding a cool element that is also masculine (this is one cool dude) with our Basic Metal Buttons. 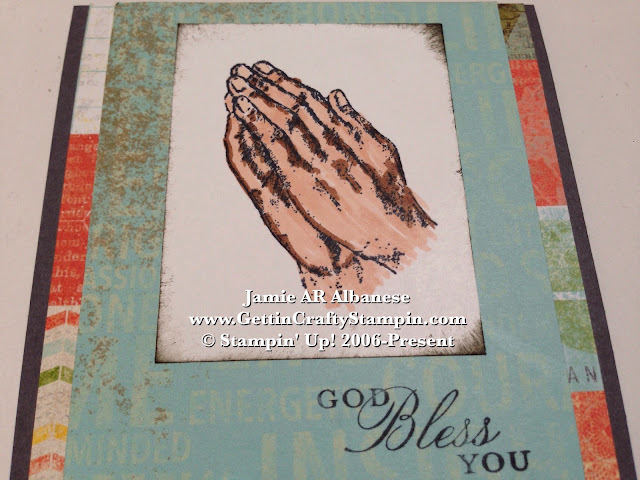 Stamp the 'God Bless You' from the Trust God with Basic Grey ink on the Epic Day Designer Series Paper. Here Luca is surrounded by his mom and some of my kiddos. What a handsome Italian boy.. I love seeing my kids and their cousins growing up together!! Add some grunge to the edges of this stamped Praying Hands with our Sponge Daubers and the Basic Grey ink on the edges. It also ties into the aged looking Epic Day Designer Paper. 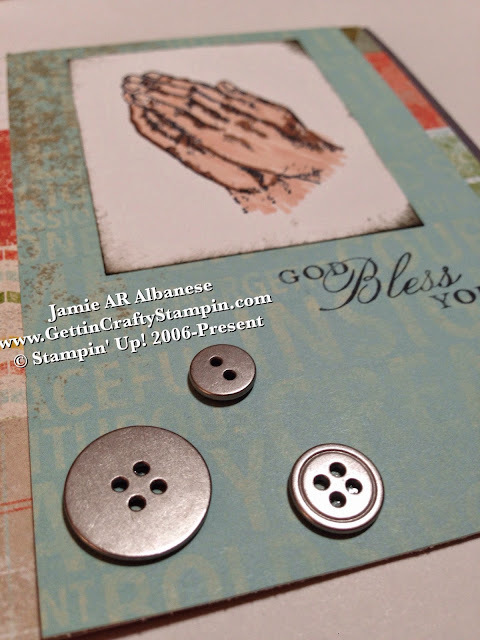 This cool accent is a great way to add a distressed element to the card. Something old, something new and something blue... in a Communion card - lol! Having Retired Stamps in my collection goes to show just how much I love our stamps and supplies! This stamp, pretty old, is timeless and ideal for celebrating a big moment in this young man's life and walk with God. 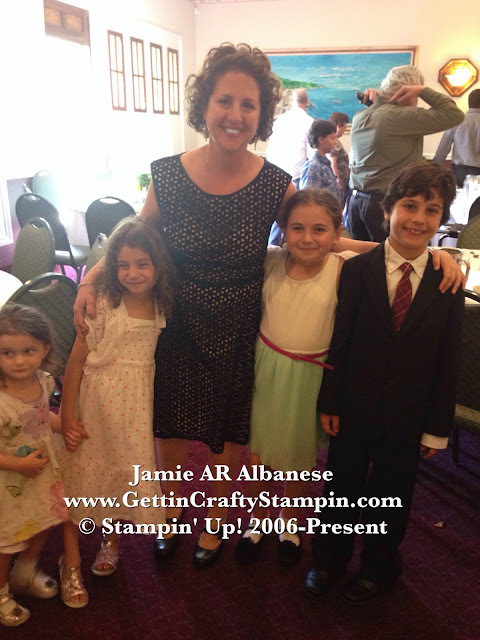 Celebrate life's moments with this cool card and timeless stamps.